Just checking in to wish everyone a Happy New Year. Hope we all experience positive changes in our lives in 2019. Finally, I'm working on a knitted sweater. And also a pair of socks that will be donated, among other handmade items, to Sequoia Humane's fundraiser in February. This is a 2-ply hand dyed, hand spun silk yarn, from 10 or 12 years ago. I had to dye the black like three times to get the silk noil really, really black. And I hand carded in the bits of color. I originally thought I'd have enough yarn for a pair of socks, but because the gauge was so small, meaning I was using more yarn than anticipated, I realized I'd need more. Then remembered I had a woven piece from back then, 40x16 inches, with this same yarn as the weft. So I UNwove the piece, because it wasn't even in my top 10 faves anyway. Unweaving meant meticulously picking the fabric apart, about 5/8 inch at a time. Took me several hours over a couple days. Now, of course, I've got enough yarn to knit another pair for myself out of this yarn. Which I just might do because it was so much fun to knit these. Happy new Year to you as well! I love all your knitting projects! I used to do a lot of it and spinning as well. I had one sweater that I kept knitting, wearing, then taking apart and making a new sweater. I loved the yearn so much and I couldn't get any more so whenever I got tired of the sweater, I turned it into something else! Wishing you the best year ever (so Far) in 2019, Connie! I love picturing you undoing the weaving to gain yarn for your socks! ;o) You were right it is an interesting story. Those are great socks. Happy New Year to you and BeeGee. See you in the mail! Love the color choice in your knitting. Beautiful! 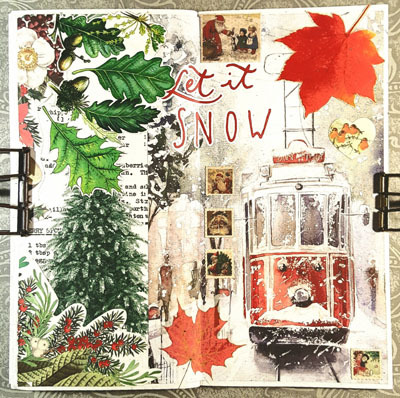 Your Let it Snow collage is fantastic. It look very cold! :-) Happy New Year! You are a woman of many talents. Wishing you a very happy new year Connie. Gorgeous socks! And a new year wish for you - here's to health, happiness, and lots of creative artistic endeavors! Happy New Year. I have never worn hand knitted socks and often wonder if I would like them. I'm so picky about socks. 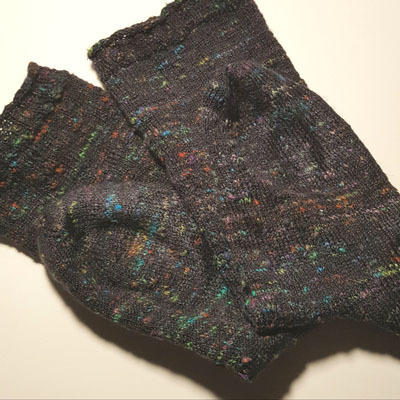 Glad you remembered the piece you had knitted and were able to pick it apart and reuse the yarn for what you love. Happy New Year. Best wishes for a healthy and happy 2019. Beautiful socks! I love a warm bed and comfortable socks! Happy New Year and here is hoping for positive changes! Cheers!